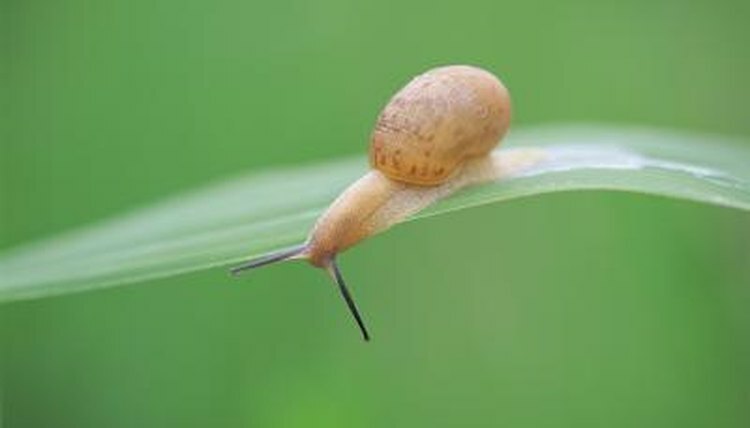 While snails are known for being notoriously slow, slimy is their second name. These gastropod mollusks are known for producing slimy bodily secretions meant to prevent their exposed soft tissues from drying out and to aid them in locomotion. Call them slow, but when a snail's survival instinct kicks in, snails are quite fast to produce a foamy, bubbly secretion to protect themselves from threatening situations. Slow and steady wins the race, but when predators are around, the snail won't likely be able to out run them. Retracting into the shell may be an option with larger predators, but with smaller predators, the snail will have to resort to plan B. For instance, when dealing with ants, retracting in the shell won't likely help as the ants can crawl inside. In this case, foaming may be helpful because the bubbly mess deters them from entering. Snails have a good sense of taste and smell and can smell a leaf of lettuce from several feet away. They will purposefully move in its direction to munch. However, when snails detect something unpleasant or repulsive, they'll be quick to react accordingly. When offered a piece of lettuce covered with a foul-tasting substance such as acetic acid, for example, snails will start to foam to protect themselves from contact with the unpleasant substance. While slime prevents a snail's body from dehydrating, bubbling can also be used as a defense mechanism. Perhaps the most dramatic display of this is seen when gardeners purposely sprinkle salt on the snail as a form of pest control. The salt triggers a process known as osmosis where water is rapidly pulled out of the snail's cells. Slime and air is pumped out to help the snail protect itself, but unfortunately, if enough salt is poured, the snail will dry out and shrivel up. While land snails use bubbles for protection, some ocean-dwelling snails get a bit more creative. In this case, snails, members of the family Janthinidae, secrete mucus and trap air inside for the purpose of creating bubbles that stick together to form rafts. These flotation devices allowed the snails to evolve from bottom dwellers to surface surfers, giving them a great survival advantage -- easy access to a favorite food source, the floating jellyfish. UCSB Science Line: Why Do Snails Bubble When Salt Gets on Them? Are Aquatic Snails Dead When They Float?